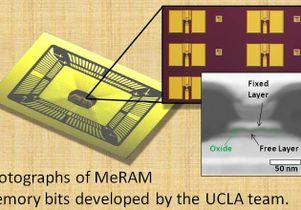 By using electric voltage instead of a flowing electric current, researchers from UCLA's Henry Samueli School of Engineering and Applied Science have made major improvements to an ultra-fast, high-capacity class of computer memory known as magnetoresistive random access memory, or MRAM. The work was supported by the Defense Advanced Research Projects Agency (DARPA) NV Logic Program. Other authors included researchers from the UCLA Department of Electrical Engineering; UC Irvine's Department of Physics and Astronomy; Hitachi Global Storage Technologies (a Western Digital Company); and Singulus Technologies, of Germany. Wang is also director of the Western Institute of Nanoelectronics (WIN), director of the Center on Functional Engineered Nano Architectonics (FENA) and a member of the California NanoSystems Institute.